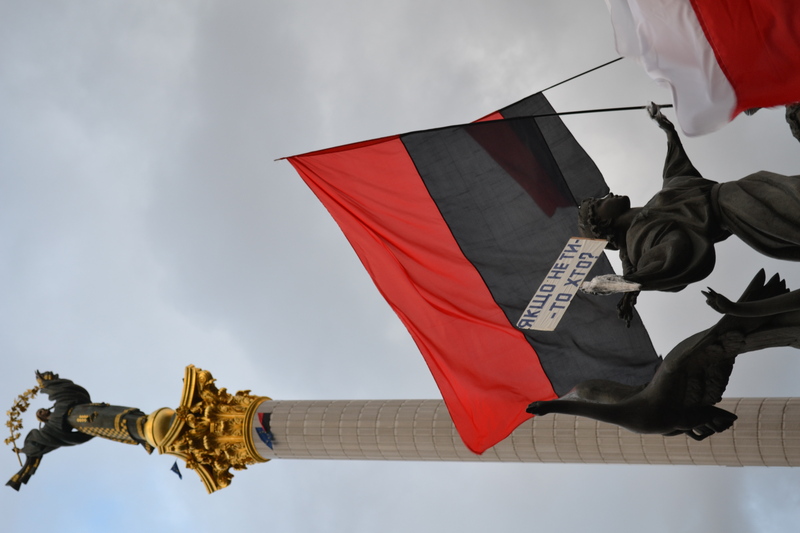 It’s an amazing time to be in Ukraine. 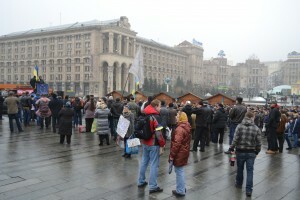 on Maidan in the morning. As you may have seen the “Euromaidan” news, mobilizations across the country have gathered hundreds of thousands of Ukrainians, largely in protest of President Viktor Yanukovych’s decision to end talks with European Union leaders in response to pressure from Russian President Vladimir Putin. These talks were to lead to Yanukovych signing an Association Agreement with the EU on Friday — this agreement would bring Ukraine into an free trade union with the EU (Putin is also pushing Ukraine to join his own Customs Union, along with Belarus and Kazakhstan) but would require Ukraine to commit to economic and political reforms, supported through IMF funding. For some other analyses of the situation, try these articles. Sunday, November 24. 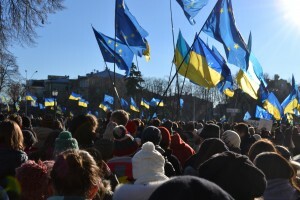 Students from Kyiv-Mohyla Academy march to Maidan to support a city-wide student strike. or with all of the European Union as well as the states which also have agreements and trade unions with the EU. If the goal is for Ukraine to become a greater participant in the global capitalist economy, then I think the latter is the better choice. 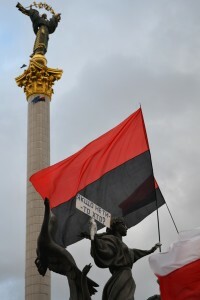 “If not you — then who?” One of the founders of Kyiv holds a protest sign against a backdrop of Ukrainian nationalist flags. A propos of my last post, it’s hard to say what those values are. 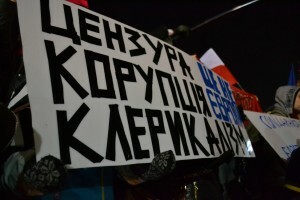 Further, I’ve been attending the gatherings at Maidan with leftist activists who hold signs that suggest that some of Europe’s values include tolerance, equality, solidarity, freedom, grassroots politics, accessible education, feminism, and women’s rights. I’ve seen these people be attacked with pepper spray and metal rods, be pushed and shoved by groups twice their number, and be shamed and called “provocateurs”* simply for their presence and their statements. Not allowing for dissent or alternative voices doesn’t seem to me to be a “European value,” or really any kind of value at all. Like everyone else, I’m still processing what’s happening, and I’m anxiously awaiting the next developments. I’d like to suggest you leave questions in the comments if I (or any other readers!) can clarify some aspects Euromaidan as it unfolds, and before we can make any real conclusions. 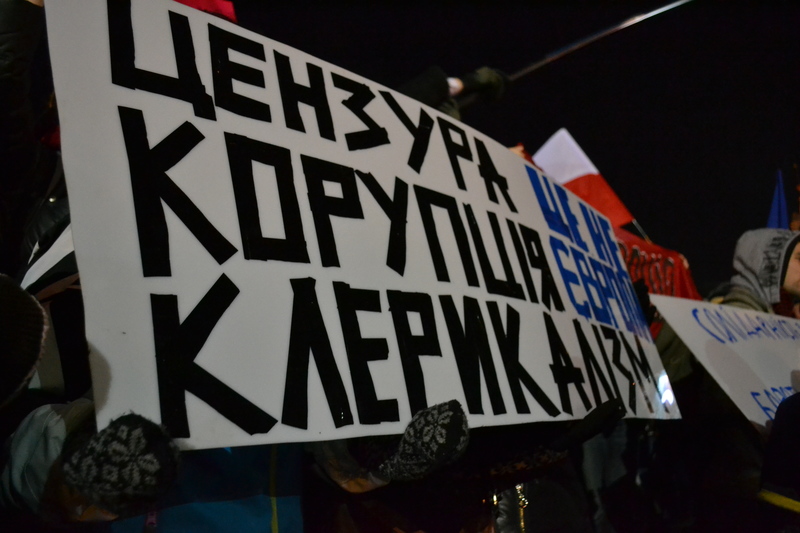 * In Ukrainian, it’s common to hear “shame” (ганьба) yelled in unison to show displeasure; a “provocation” (провокація) is when a group of people come to something like the peaceful gathering on Maidan to intentionally piss everyone else off and cause trouble. I am impressed by the peaceful protesters approach. “Don’t be overcome by evil, but overcome evil with good”.